Scroll down to purchase red worms. Thank you! Red Worms ( scientific name eisenia fetida). These are the common compost worm. This worm will grow to about two to three inches long, is a prolific breeder, and will compost organic matter in huge amounts. Red Worms are also known as Red Wigglers, Brandling Worms, Tiger Worms and as Red Californian Earth Worms. Red worms do amazing things for our planet. They are Gods living compost machines. They devour our garbage and turn it into thick, dark, nutrient rich compost that will cause yields in gardens to increase and indoor plants to thrive. The best part is that you don't have to spend all that money and have all the negative effects of store bought? fertilizers. This is why we compost with red worms and believe every home should. Our mission is to create a viable worm industry, so that there is an alternative to the landfills of today. Compost your garbage and save the world. Not to mention you will get millions of free worms to sell, fish with or to give to others. The prices below DO include shipping! We prefer to ship via priority mail. Now is the time to buy! Buy now for summer production. Five Pounds (5lbs.) of Red Worms - 5000 Red Worms For $112 Delivered! *When you receive your worms please remember the following. We ship them in bedding that is on the dry side, so please add water to the bedding right away. Place the worms into their new home. Use moist, but not wet, peat moss.? Do not feed the worms for the first three days. That will allow them to eat the peat, and to acclimate to the new bedding. Place a night light over the beds or bins for three of four days to stop the worms from crawling out of the bin. Keep the lids off and the lights on. After three days the worms should settle in, and you should be able to turn the lights off. If you are keeping worms outside always have lights on when it rains. The worms like to travel when it rains. If you are looking to compost with Red Worms you will want to know how many worms it will take to eat your garbage. Generally it takes 2000 worms to eat one pound of garbage per week. It is important to remember that the worms will multiply at a pretty good rate. 1000 worms under proper conditions can turn into 1 million capsules, and worms in a year. The pH of the worm bed should be around 7.0. You can get a good chemical soil test kit at the local garden shop for about $3.00. They also sell mechanical testers, but I do not trust them. Red Worms are great worms. To keep the pH at around 7 you will need powdered limestone. The type you will need is Calcium Carbonate, or agricultural lime stone. The hydrated lime, and pellet lime will burn the worms, and will kill them. Red Worms. cannot be placed directly into a garden to enrich soil. Red Worms require constant moisture, and organic matter. They will die in a matter of minutes in a garden or lawn. It takes about 6 to 8 weeks for Red Worms to go from capsule to breeder. Each capsule contains between 4 and 20 worms. Red worms require constant moisture, and food. The food that red worms eat consists of decaying vegetables, food scraps, paper, and other types of organic material. Red worms are not good for use in aerating gardens, or lawns. 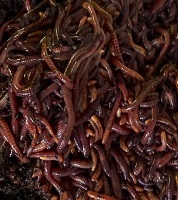 Red worms are indigenous to manure piles, and need a constant supply of food and moisture to survive. This doesn't mean that red worms are not good for the garden. They are great! It means that you will have to culture the worms in a pit or bed, and then move the castings to the garden, flower pot, or lawn. 5.Powdered Worm Food. Purina make a worm food called "Worm Chow". All of the above feed will work well, as long as you watch for heat that can come from decaying matter, pH, and moisture. Mix your bedding a few days before you add the worms so that your bedding will be past the heating stage when you add your worms. Some bedding has a tendency to heat when bacteria begins to break it down. By leaving it for a few days after adding water the bedding should be ready for the worms. Our policy is guaranteed live delivery! Please call, or e-mail us within 24 hours of delivery if there is a problem with your order. We cannot give replacements or refunds after the 24 hour period. Please deliver worms to a destination where someone will be available to receive them, or designate hold at the post office so that your worms do not sit out in extreme heat or cold!